The Chairman of the PCA, Mr Harold Scruby, today congratulated the NSW Minister for Roads, the Hon Carl Scully, on his decision to install flashing orange, solar-powered lights at the Middle Harbour School at Cremorne in Sydney. Mr Scruby said: “This will be the first trial of flashing orange lights coupled with a speed camera. While previous trials have been inconclusive, the PCA believes that when coupled with the enforcement function, the vast majority of drivers will slow down and obey the law. “NSW was the first state to create 40 kmh School Zones around all schools, over 18 months ago. It was a tough political decision at the time but it has undoubtedly saved many lives and limbs of our greatest assets … our children. Mr Scruby added: “A study conducted in September last year revealed that 4,689 motorists had been booked in this zone over a 5-week period. But the good news is that over 886,000 motorists (over 99%) obeyed the speed limit during the same period. However, we believe this could still be significantly reduced with the addition of the flashing lights. Best-practice Road Safety requires equity and fairness. The PCA believes that the vast majority of motorists would have been speeding in this zone, unintentionally or inadvertently. Many motorists claim they are sometimes confused as to whether the schools (public or private) are on holidays, what day of the week it is and the precise time. The flashing lights will be activated only during the morning and afternoon school zone hours on school days. This will eliminate any guess work and confusion. “Anecdotal evidence suggests most motorists agree with 40 kmh School Zones, but they want warning Flashing Lights. Anyone caught now has only themselves to blame and must accept the consequences. “We expect to see a dramatic reduction in the number of motorists booked during this trial at this location and if successful, we will increase our campaign for Speed Cameras and Flashing Orange Solar Powered Lights around every school in NSW. MIDDLE Harbour Public School principal Wayne Bensley says he is disappointed at the location and effectiveness of the RTA's new flashing lights outside the school in Ourimbah Rd. In a letter to the RTA, Mr Bensley said the lights were “partly obscured by trees and far too high to be readily noticed or in your face”. “These flashing lights are simply not in the driver's natural line of sight,” he wrote. The school has joined the State Government's trial of flashing lights in 43 school locations as an additional road safety measure announced by NSW Roads Minister Carl Scully at the end of July. Mr Scully said Middle Harbour was a unique site with substantial peak-hour traffic. Mr Bensley said the first he was aware the flashing light trial was going to take place was hearing about it on an evening news bulletin. No contact had been made with the school. This strongly suggested they were less visible and less effective than they could be, he said. 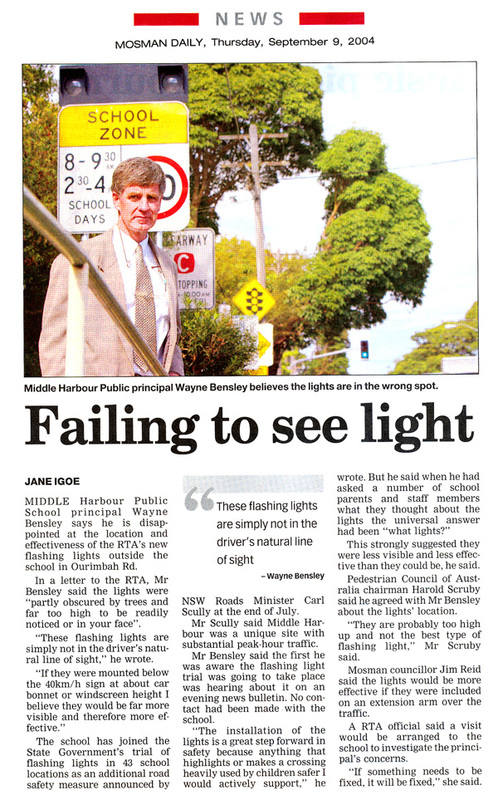 Pedestrian Council of Australia chairman Harold Scruby said he agreed with Mr Bensley about the lights' location. “They are probably too high up and not the best type of flashing light,” Mr Scruby said. Mosman councillor Jim Reid said the lights would be more effective if they were included on an extension arm over the traffic. A RTA official said a visit would be arranged to the school to investigate the principal's concerns. “If something needs to be fixed, it will be fixed,” she said.